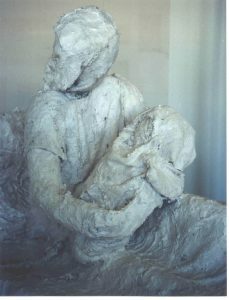 Throughout the film, as filmmaker Sheila Ganz tells her story she creates a life-size sculpture of a mother holding her baby in a hospital bed using bamboo, chicken wire, burlap and plaster. The sculpture commemorates the 10 minutes she was allowed to hold her baby. in their lives with illuminating historical background.